The price of Bitcoin is falling once again and drags down all the other cryptoassets. But the main thing in question now is not how deep will it go, but how long will the diving last. It almost became a tradition in crypto community: waiting for the New Year sales in the market. And the last 3 years made us believe that a 30–60% slump in January is inevitably followed by a cryptorally. That was the main reason why people weren’t worrying too much when Bitcoin started its correction from 19000 USD. But as the price went lower investors started to lose temper. And their fears seem reasonable enough if we take a closer look at not so distant past of 2014. On one hand the end of 2013 and the beginning of 2014 look just like usual New Year dynamics: new highs, retreat, another wave of rise and fall. 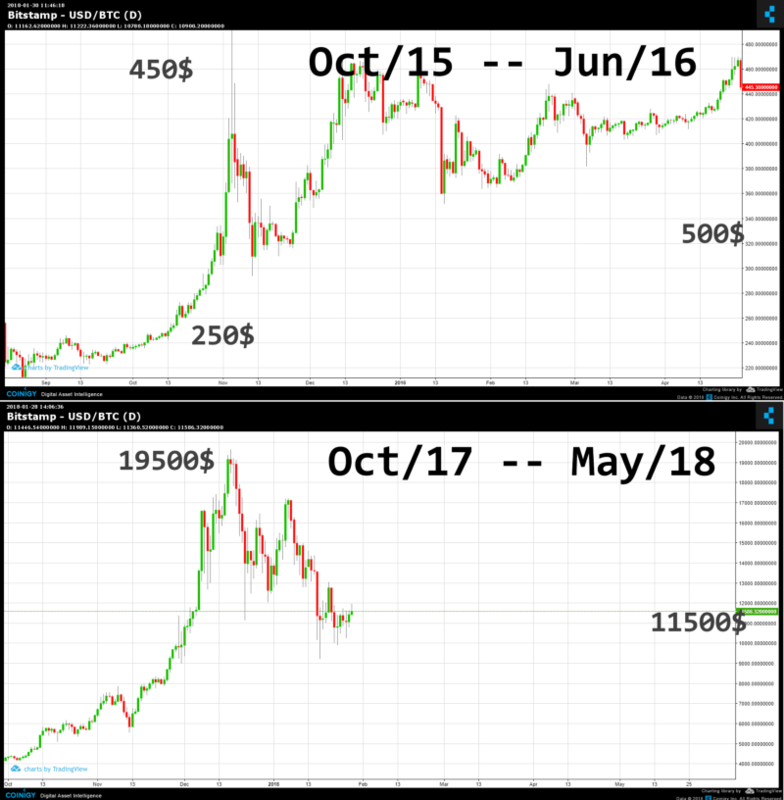 On the other hand record highs in 2013 turned into long term correction in 2014 which led to 88% of capitalization lost (price dropped from 1200 to 150 USD). Next time Bitcoin reached 1200 USD only 3 years later — in 2017. With price pattern of 2013–2014 in mind the current fork “rise or fall” doesn’t look as optimistic as it did before. 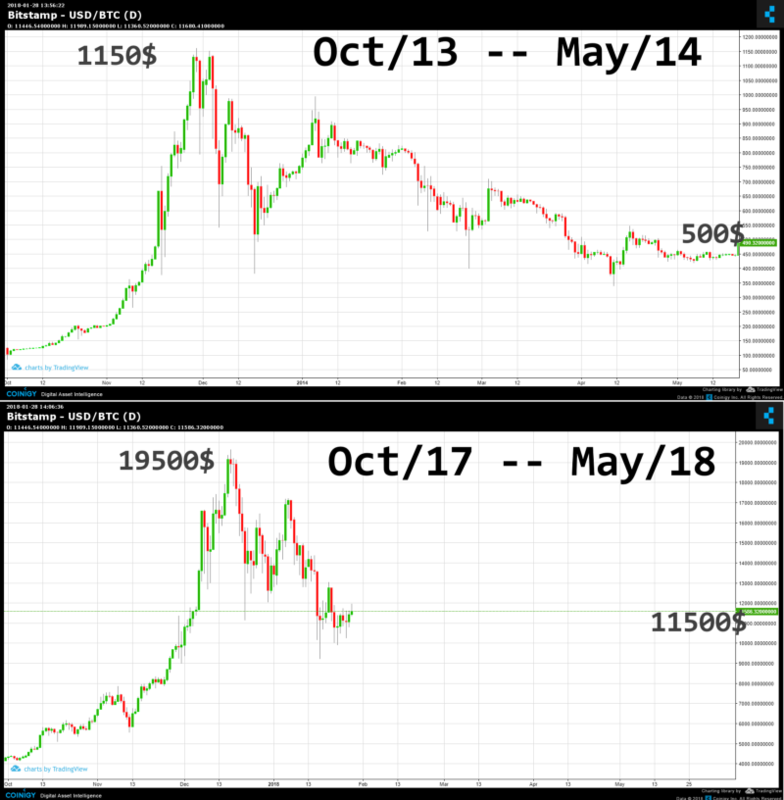 One of the reasons is the similarity in price dynamics before correction: in 2013 Bitcoin rose from 14 to 1200 USD (over 8000%), in 2017 it went up from 1000 to 20000 (1900%). For the contrast in 2015 and 2016 Bitcoin rose by 120% and 110%. 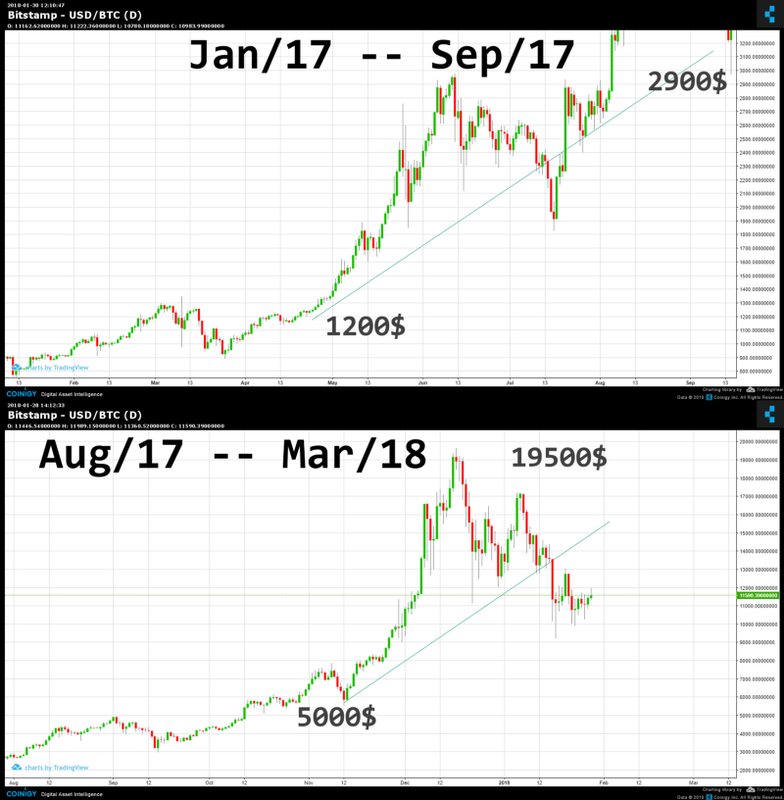 At the same time there are reasons for end of the correction soon. Stages of rise and correction similar to this winter one are seen in Bitcoin price dynamics pretty often and not only at the end of the year. 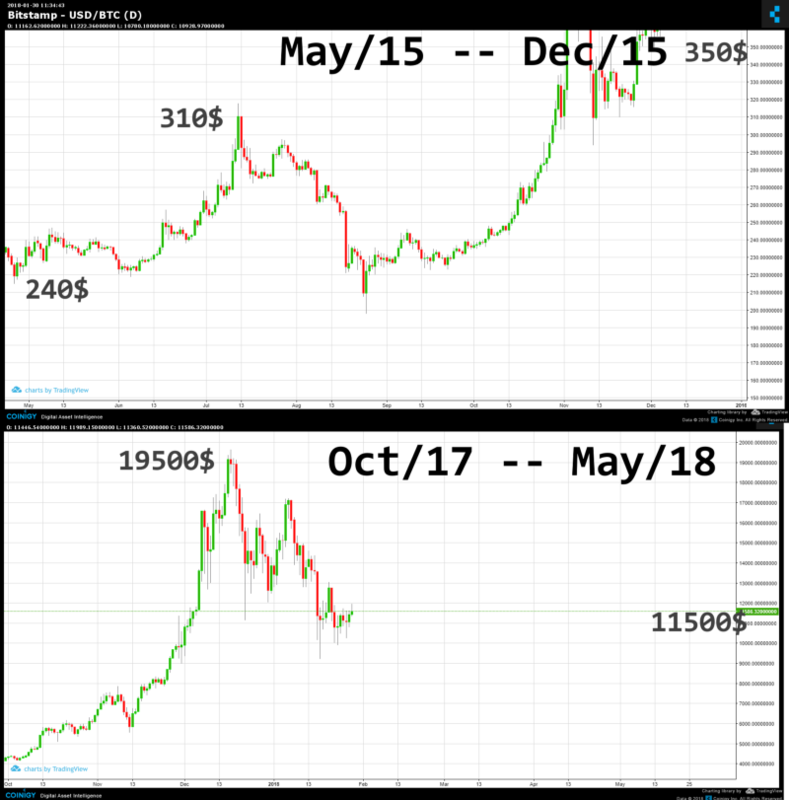 Current price chart is almost identical to what took place in the middle of 2017 when falling was suddenly replaced by rally. Investors attitude to Bitcoin in 2018 is much different compared to what it was in 2014. As of today there are much more investors waiting for reasonable discount to allow taking the long position in Bitcoin. There must be some fundamental negative factor to let cryptomarket lose 90% of its capitalization. It is not possible to say how long will this correction last. 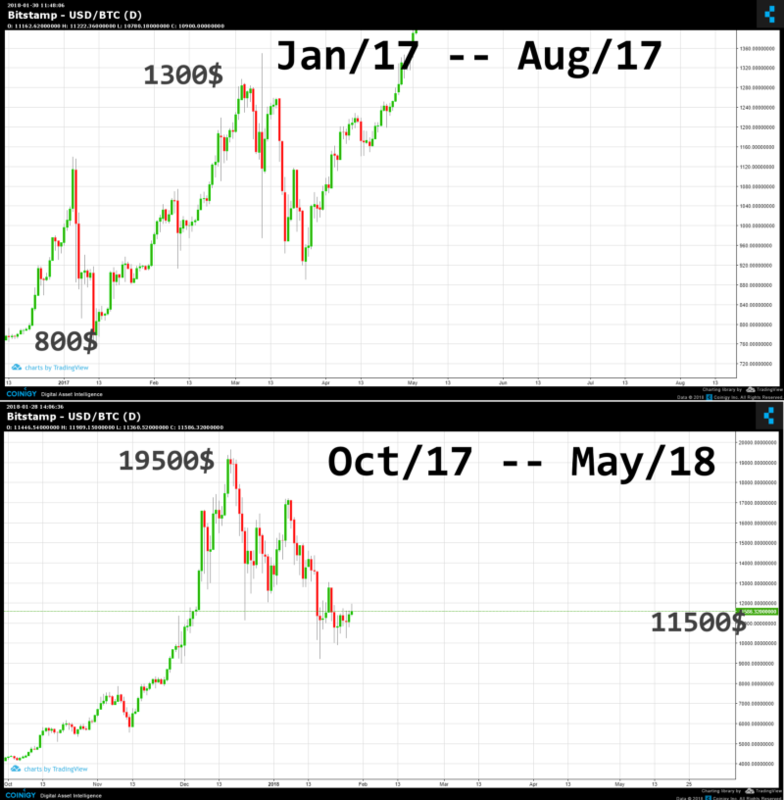 Maybe we will see 19000 USD in 3 months or in 3 years. Charts analysis tells us that there are arguments for both scenarios. In 2015–2016 complete exit from correction and update of the highs took 7–10 months. In 2017 it took just 2–3 months. Dramatic pace of cryptomarket evolution and mass adoption of Bitcoin had shortened the rise and fall cycles which is one of the main reasons to believe that the end of correction is near. But quite aggressive price rise of Bitcoin in 2017 and the depth of the current correction may signal that Bitcoin will see 20000 USD again not earlier than in 5–10 months.